Hi! We are The Improve Group, an evaluation consulting firm based in St. Paul, Minnesota. Our evaluation team were inspired by the topic – how does data ownership affect “great” data – to hold a lively debate and create this post. Since we are frequently hired by foundations, government agencies, and nonprofit organizations to evaluate work with communities, we find ourselves in a quandary about who truly “owns” the data. We wondered who should own the data we collect for it to be truly great data. Over lunch recently, we divided into groups for a mock debate about which stakeholder “owned” data: the client, the evaluator, or the community. We played devil’s advocates with rebuttals to the arguments for and against each data “owner” until we landed on pros and cons for each stakeholder! Our arguments for and against different data “owners” show that the context of the project—the client and their relationship with the community; who the “community” is; and level of trust on a project—influence who should own the data. Thinking about who owns your data through the lens of multiple stakeholders can have a tremendous impact. Data ownership affects participation in the evaluation itself, and how the findings are eventually used – which, after all, is why we want great data. Check out the work and teachings of Nicky Bowman of Bowman Performance Consulting. She has been a frequent contributor on this blog, on EvalTalk, and at evaluation conferences, and has frequently raised issues of sovereignty and data ownership in those venues. She’s highlighted the work and contributions of other indigenous evaluators. She has been a friend and inspiration as we think more deeply about who owns the data. This is a great exercise for any evaluation team. It is also an important reminder that the public is typically excluded from access to data that it should own: government data, publicly funded academic research, personal biomedical information, etc. 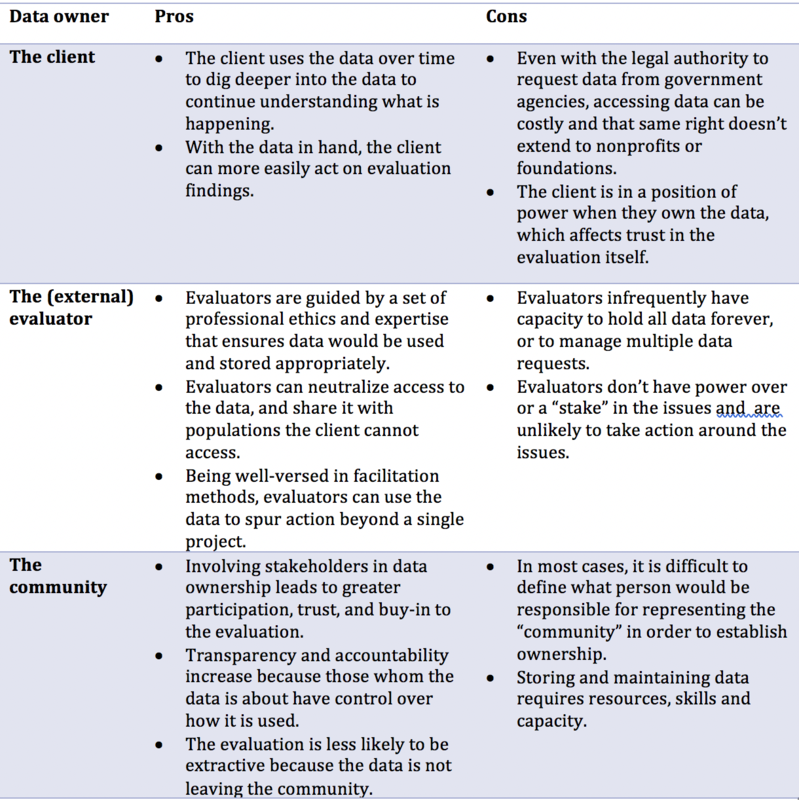 Thinking about ownership of data is important, but it is a sliver of the conversation we need to have about power, ownership, and participation in evaluation. Advocates of the equity evaluation framework, suggest that we should look at “ownership” or participation in the entire monitoring, evaluation, and learning process. Maybe we need to debate these questions of ownership when we begin to tease out our problems and questions.